Despite our best intentions, most diet resolutions are broken within one week. That’s why we designed this 7 day diet – if you can follow our plan for one week, you’re more likely to successfully complete our full 28 day plan! Make 2017 your healthiest year yet! Enjoy a free trial of Ayhan’s delicious recipes from his exclusive 28 Day Diet Plan. 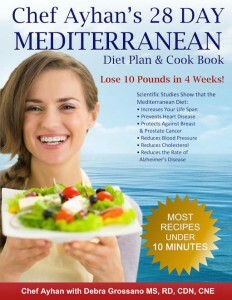 You may purchase the entire collection of recipes and valuable information about the Mediterranean Diet in hardcover or Kindle format by going to http://www.amazon.com/Chef-Ayhans-Mediterranean-Diet-Plan-ebook/dp/B00IO4WZMU.